I have sold a property at 3470 CARNARVON AVE in North Vancouver. Here is a pretty house on a quiet street that offers wonderful views, loads of natural light & lots of updates. The open concept main floor features an updated kitchen that flows from the dining area over to the living room where you'll find a gas fireplace. The upper deck stretches across the entire front of the home & enjoys all day sunshine & beautiful views. There are also 3 bedrooms on this level & the master bedroom has an ensuite powder bathroom. The lower level is fully above ground & host a large family room that's just off the foyer. The family room opens up to a garden level sundeck & provides access to the front yard. The 1 bedroom suite has a separate entrance & patio doors leading to a private garden area. The suite also shares a interior door so it could be a 4th bedroom. I have sold a property at 503 121 29TH ST W in North Vancouver. TOP FLOOR 2 bedroom and 2 full bath condo with peaceful mountain and British Properties views. Nicely updated with newer paint, carpet, valour fireplace, hot water tank, fridge and stove. This spacious 2 bedroom suite features large master bedroom with sitting area and ensuite bath, vaulted ceilings, skylite and large balcony. The complex is well run, fully rainscreened and the amenities include indoor pool, exercise room, workshop, library, entertaining lounge plus 2 guest suites. For your safety secured parking and a live in caretaker. Situated in convenient Upper Lonsdale close to shopping, transportation and your morning latte. One owner must be 55+. I have sold a property at 201 121 29TH ST W in North Vancouver. I have sold a property at 216 121 29TH ST W in North Vancouver. I have sold a property at 104 2545 LONSDALE AVE in North Vancouver. I have sold a property at 101 2615 LONSDALE AVE in North Vancouver. Large 2 bedroom corner apartment in Upper Lonsdale. This nicely updated 915 sqft condo is bright and spacious and features a tastefully renovated kitchen separate dining room and sunny southwest facing wrap around balcony. Building updatesinclude newer roof, updated balconies and brand new windows and sliders. Also Insuite laundry, secured parking and storage. Great Price! Call today! I have sold a property at 412 2800 CHESTERFIELD AVE in North Vancouver. I have sold a property at 314 2800 CHESTERFIELD AVE in North Vancouver. I have sold a property at 211 2800 CHESTERFIELD AVE in North Vancouver. This spacious 1332 sqft condo is perfect for house sized furniture. The floor plan is extra roomy and features 2 bedrooms, den, large kitchen with stainless appliances, walk in closet and dressing vanity. The building is fully rainscreenedand situated in Upper Lonsdale close to Starbucks and shopping. A perfect building for the active 55+ (other 19+) with an indoor pool. caretaker, workshop, exercise room, social room and 2 guest suites (45.00 a night). 1 small pet is allowed (maximum 15lbs) Measurements from the strata plan are to verified by the buyer. I have sold a property at 311 2800 CHESTERFIELD AVE in North Vancouver. Somerset Green is an adult orientated 55+, other 19+ complex with fabulous amenities and a completely new retrofit to the entire building. Situated in desireable Upper Lonsdale close to transportation and shopping. This lovely corner condowith private garden patio features lots of windows, 859SF, gas fireplace, a large kitchen with eating area and a spacious master bedroom with oversize walk through closet and dressing room. You will love the indoor pool, hotub, workshop, 2 guest suites, social and exercise rooms and the benefits of a live in caretaker. 1 small dog (max 15lb) or cat welcome, sorry no rental. Measurements from Strata plan are approximate , to be verified by the buyer. I have sold a property at 101 2545 LONSDALE AVE in North Vancouver. Don't miss it! 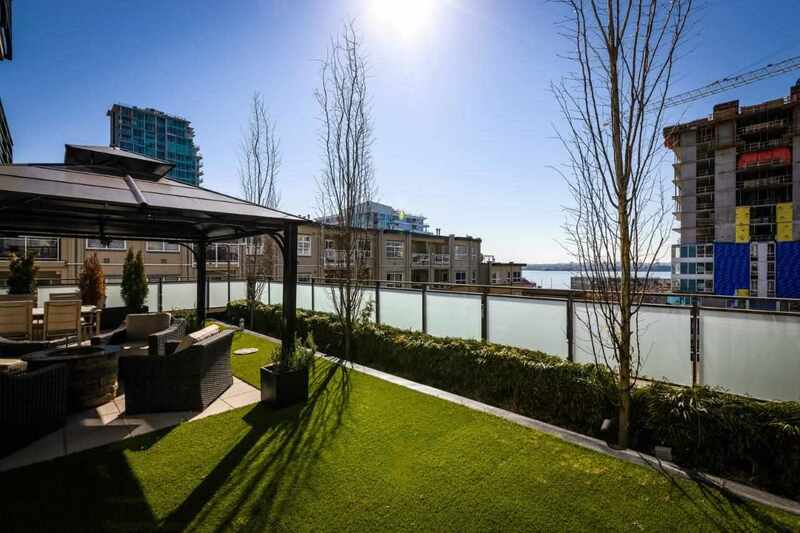 This lage one bedroom with in-suite laundry, Upper Lonsdale apartment needs nothing! Features an updated kitchen with stainless steel appliances and granite counter tops, updated bathroom with slate floor, and the livingroomfeatures a beautifully updated fireplace. Building has recently upgraded the roof, plumbing, front hallway, and common areas. If you're looking for a large, affordable, updated 1 bedroom with in-suite laundry in a solid building, here it is! I have sold a property at 209 121 29TH ST W in North Vancouver. I have sold a property at # 205 121 W 29TH ST in North Vancouver. Lovely views to downtown and the city from this immaculate 2 bedroom corner unit in Somerset Green. An excellent layout with spacious proncipal rooms, the master bedroom comes with an adjoining dressing room and full ensuite. Featuresinclude: insuite laundry, gas f/p, large south facing balcony, e/a in the kitchen and lots of windows & light. Somerset Green is a 55+ complex with indoor pool, hot tub, library, lounge, exercise area, workshop, 2 GUEST SUITES and on site caretaker. This lovely condo is in move in condition and a complete envelope remediation was recently completed on the building. A perfect home for the 55+ buyers. Enjoy the social get-togethers and even bring your small pet. Sorry no rentals allowed. I have sold a property at 313-2800 Chesterfield Ave in North Vancouver. Designed for the 55+ age group this spacious 2 bedroom 2 full bathroom condo boasts all new appliances, new carpeting, paint and bathroom floors. Situated in desirable Somerset Green where a complete envelope remediation is virtuallycompleted and the seller has paid in full all the special assessments. This 1118 sqft condo is in a quiet location overlooking the gardens and has SE exposure and a large balcony. The excellent amenities include: indoor pool, 2 guests suites, jacuzzi, on site caretaker, library, secured parking and lounge. Small pets are welcome but sorry no rentals. This lovely condo is in move in condition and immediate possession is possible. I have sold a property at 506-2800 Chesterfield Ave in North Vancouver. A great opportunity for the 55+ to own an extra large 1 bedroom condo in the refurbished and desireable Somerset Green Complex. The master bedroom has a full ensuite and dressing room, the eating area in the kitchen would make a perfectcomputer space and the living and dining rooms will fit all your house size furniture. A top floor unit with lots of light, high ceilings and skylites. Newly rainscreened on the outside and inside a indoor pool, 2 guest suites, whirlpool, workshop, clubhouse and secured underground parking. Almost 900 sqft - good value.